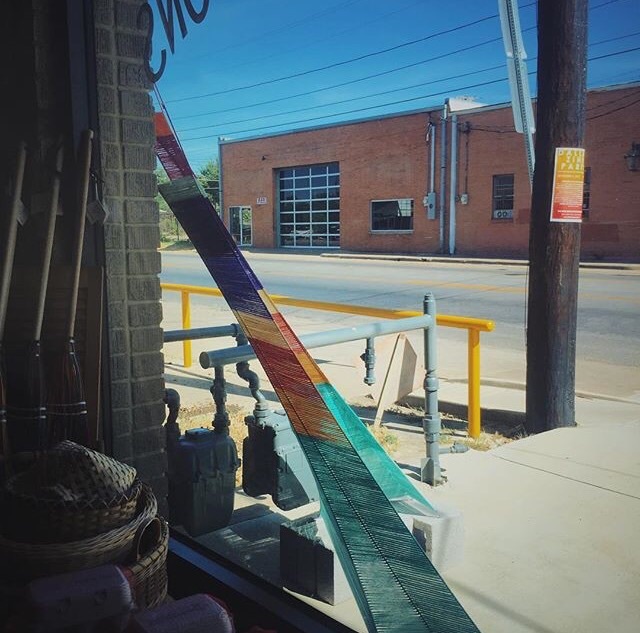 A collaboration between space and yarn, an installation by Sheryl Anaya at Raza Cosmica, an Oil and Cotton window gallery. Sheryl Anaya is a Puerto Rican artist who currently resides in Dallas, Texas. She graduated with a Bachelor of Fine Arts from Texas Woman’s University in 2013. Currently, she is pursuing a Master of Science in Library Science with a concentration in Archival Studies from the University of North Texas. Her work explores themes related to identity, personal experience, and memory by way of installation and self-portraiture. She is interested in creating work that engages an audience, whether through the physical use of space or on an emotional level. In addition to being an artist, Sheryl is the coordinator for the Lillian Bradshaw Gallery in the Fine Arts division of the Dallas Public Library, where she also participates in outreach to help develop arts related programs for the community. She is currently a member and president of 500X Gallery and has exhibited in venues such as the Latino Cultural Center, K Space Contemporary, Rockport Center for the Arts, and Washington Street Art Center. Sheryl is also the editorial assistant of Light Leaked, an online photography magazine that creates dialogue about photographic creation, both conceptually and in business. RAZA COSMICA is a window gallery curated by artist Analise Minjarez at Oil and Cotton. Devoted to exploring the intersections between craft and fine art, these projects connect Oil and Cotton students and Oak Cliff community to artists working in Dallas and beyond.